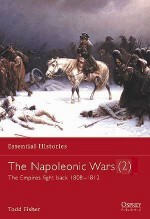 This volume covers Napoleon's gradual fall from power, beginning in the spring of 1813, when France prepared to face the vengeance of Russia and Prussia. quickly raising new armies composed of inexperienced conscripts and invalided veterans, and with a critical shortage of cavalry, Napoleon resolved to preserve his empire in Germany, where he initially managed to achieve some hard-fought victories. When at last Austria threw in her lot with the Allies and the epic Battle of Leipzig followed, Napoleon was forced to retreat across the Rhine, there to resist the onslaught on home soil. The pressure against him proved too great, and with Paris lost and his marshals refusing to fight on, no option remained but abdication. Yet his last battle, and one of the most decisive in military history, was still to come: Waterloo.